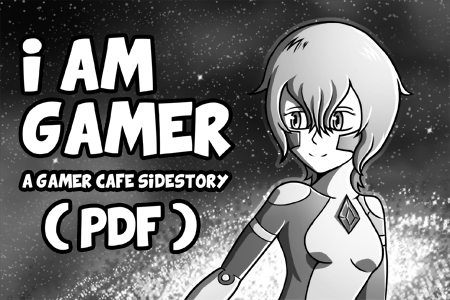 A 10 page side story of my webcomic Gamer Cafe. The comic was made exclusively for The Galway Argh! 's first issue for July 1st 2015. When I was asked if I wanted to make a comic for the new anthology coming out my first instinct was to take a story I already had in the works - Heidi's back story - and make it with original characters. However some time during production I decided to re-attached it and keep the Gamer Cafe name on it - make it her canon story. So it spent enough time as it's own little beast that I AM GAMER can be read without knowledge of the Gamer Cafe webcomic and vise versa - you don't need to read the comic to understand the webcomic and you don't need to read the webcomic to understand this. They both exist in their own little world, but they're in the same universe and setting. Yea that would be a cool comic. Hope you do more on the gamer life style out of games. The friends and the fun and places.